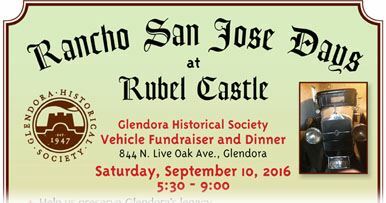 Please join us on Saturday, September 10th, 2016 for a dinner in the Castle courtyard with live entertainment. Proceeds from this first Rancho San Jose Days will be used to fund the restoration of the vintage cars, trucks, and tractors in the Castle’s collection. The goal of this year’s vehicle restoration project is to return to working condition an early Studebaker motorcar and an early Chevrolet flatbed truck used in the citrus industry here in Glendora. The Society is seeking your support to return these vehicles to working condition so that they can be used in Glendora civic events like the annual Christmas parade. he cost is $45 per person and due to limited seating, paid reservations are required. There will be no tickets sold at the door. Wine and beer, as well as soft drinks, are included in the cost of dinner. A silent auction and opportunity drawing will be held and the vehicles slated for restoration will be on display. You can download a printable flyer and send or forward to friends.